Cord Garcia topped a field of 787 players to win the 2017 Heartland Poker Tour Golden Gates $1,650 no-limit hold’em main event, taking home $248,732 and his second HPT main event title. 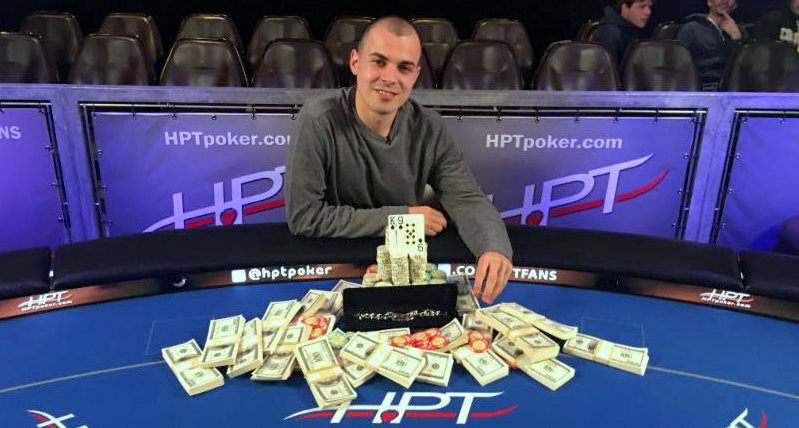 Incredibly he won the same event roughly five months ago, outlasting a field of 488 that time to earn $164,988. This go around Garcia, who took down the first-ever WSOP Colossus event back in 2015, not only had to deal with a larger field but also with a very accomplished final table. Joining him in the top nine finishers were 2016 Colossus winner Ben Keeline (6th – $39,103), Zo Karim (5th – $50,903) and Dan O’Brien (2nd – $153,982). Going into the final table Karim was the chip leader, with Garcia in second chip position and O’Brien close behind. Garcia scored a few knockouts to take the lead and then sent Karim packing when his A K held up against Karim’s A Q . From there he was able to survive to heads-up play against O’Brien, taking roughly a 3-to-2 chip advantage into the final showdown. O’Brien and Garcia battled for several hours. The key hand of their showdown saw all of the chips go in preflop with O’Brien holding the K K up against Garcia’s A Q . The flop and the turn improved neither player, but the A on the river gave the massive pot to Garcia and left O’Brien with only a few big blinds. O’Brien was unable to recover after that hand and shortly afterward it was all over. In addition to the title and the money Garcia also earned 912 Card Player Player of the Year points. This was enough to see him climb to 28th place in the overall standings, which are presented in 2017 by the Commerce Hotel & Casino.